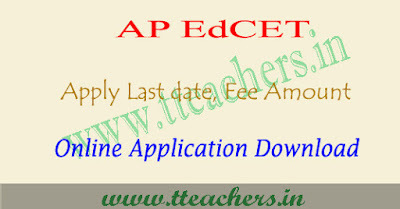 AP EdCET 2019 application form, ap ed.cet apply online : AP EdCET 2019 application form has been released in the month of February 2019. Andhra University, Visakhapatnam conducts edcet entrance test for admission into B.Ed. Regular Course in the University, Government, Aided and Private Colleges of Education in Andhra Pradesh for the academic year 2019-2020. Candidates seeking admission in Education courses may apply to this ed.cet 2019.Here we have to given more information about AP EdCET application form 2019 through this article. Candidates who want to apply to AP EdCET 2019 can fill the ts ed.cet application form 2019 from March 2019. The application form available till April 2019 (upto 5:00 PM). Students can fill the application form through official website. Candidates can also visit the nearest centres for filling the online application form. Candidates can visit the nearest helpline centre along with application fee. How to apply : The candidates who satisfy eligibility criteria can apply for APEdCET-2019 through an online application in the web site www.sche.ap.gov.in/edcet. APEdCET-2019 Applications should be submitted through ONLINE mode only. For online submission, visit the Website www.sche.ap.gov.in/edcet candidate has to pay registration fee Rs.400/- for SC/ST and Rs.600/- for others. By opting any of the following modes of payment AP Online / Debit / Credit Card and Net Banking, after filling the online Application form with the required details, verify all the details carefully and press Submit button. Filled in the Online Application Form will be generated of which contains registration number along with filled in details. Take print out of filled in Online Application Form. Use the Registration number for future correspondence.